A blog about a girl who, for 18 years was a veritable Modern Day Nomad with itchy feet and a lust for accumulating languages, until she met and married her Romanian toyboy and produced a small, but very chatty baby girl. Status Viatoris is now about the highs and lows of bringing up a trilingual sproglet, in Italy. It also touches on ecology, depression, atheism and an array of other random topics. 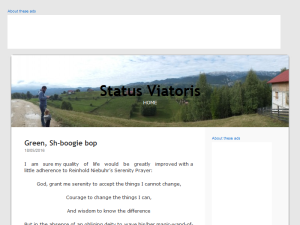 This what your Status Viatoris - Tales from a Modern-Day Nomad Blog Ad will look like to visitors! Of course you will want to use keywords and ad targeting to get the most out of your ad campaign! So purchase an ad space today before there all gone! If you are the owner of Status Viatoris - Tales from a Modern-Day Nomad, or someone who enjoys this blog why not upgrade it to a Featured Listing or Permanent Listing?